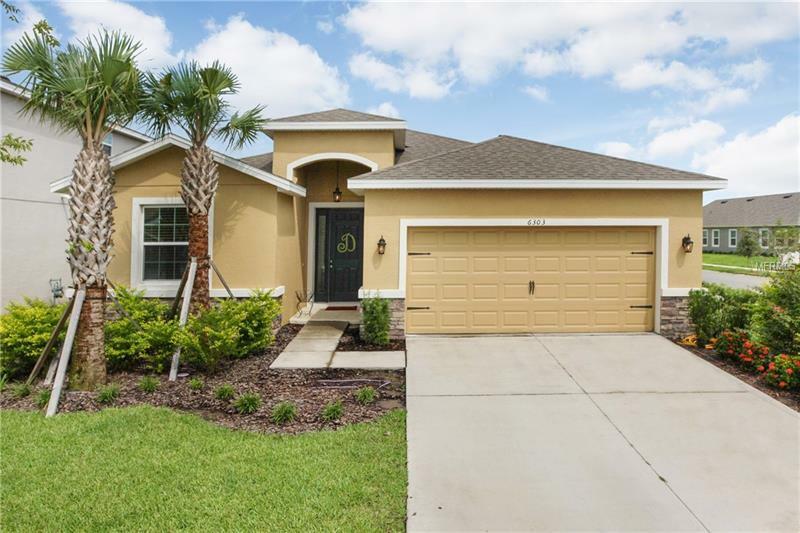 This well laid out Lantana floor plan boasts 4 spacious bedrooms, a large master bath with soaker tub, another full bathroom conveniently located between 2 secondary bedrooms and a half bath next to the 4th bedroom and laundry room. This open concept floor plan has a large family room, kitchen and dining room combination leading out to the large covered patio and fenced in backyard. Large kitchen island for more seating. Neutral paint colors throughout. The best thing about this home is the walkability to two of Waterset's best amenities. The Waterset Club recently opened and includes 2 pools, one lap pool and a lagoon style pool with a zero entry and 2 fun waterslides. Also enjoy tennis, pickleball, basketball and sand volleyball courts at this location. A top of the line gym, playground and clubhouse round out the center. The Lakeside has a fenced in splash pad, playground, bbq area with hammocks and a covered patio with ample seating, a dog park and outdoor fitness equipment. A quick drive up the road and you will find The Landing which is the community cafe, another pool, playground and gym as well as a fishing dock. Walking trails throughout the community. Come see why so many families make Waterset their home! All room measurements are estimates, buyer to verify measurements.